A West Virginia teen arrested and accused of nearly inciting a riot after a confrontation with a teacher over his National Rifle Association t-shirt has inspired dozens of students across his county to wear similar apparel in solidarity. Jared Marcum, 14, had a confrontation Thursday with a Logan Middle School teacher over his NRA t-shirt, which bears the organization's logo, along with an image of a hunting rifle and the phrase, "Protect your right." Marcum's lawyer, Ben White, said that when the teen was told to remove the shirt or turn it inside out, he attempted to engage the teacher in a debate. "Jared respects firearms and has training to use them, and believes in the Second Amendment," White told ABCNews.com. "He believes it's being threatened by current legislation. 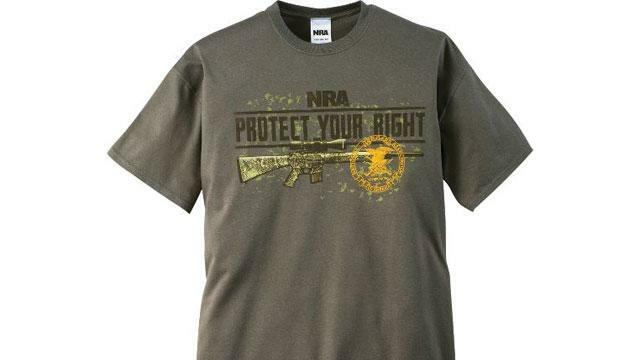 He wore [the shirt] as an expression of political speech and the need to protect the Second Amendment." Logan City Police Chief E.K. Harper told ABCNews.com that Marcum was not arrested for wearing a t-shirt, but for "disrupting the school process." "His conduct in school almost incited a riot," Harper said. Marcum was not put in jail, Harper said, and was released to his mother after less than 30 minutes at the police station -- normal procedure for a juvenile arrest. White said that charges being filed against Marcum are pending the prosecutor's office's review of the evidence. But he insisted that it was the teacher who caused the issue by confronting the teen, and that video gathered from the school will prove it. "I believe the teacher was acting beyond the scope of his employment," he said. "What the video shows is that students did step up on the benches to the tables in the lunchroom when they were escorting Jared out of building. Kids jumped up, clapping. Teachers said to get off and be quiet, and they did." Logan county schools' dress code, which is posted online, prohibits clothing and accessories that display profanity, violence, discriminatory messages or sexual language, along with ads for alcohol, tobacco or drugs. There is no mention of the NRA or guns. "My belief is that if the teacher could have applied some common sense and say, 'I think that violates the dress code. Let me check with the dress code,'" White said. When contacted by ABCNews.com about the incident, Logan County Schools Superintendent Wilma Zigmond said that she was not at liberty to discuss students with the media, but indicated that more than the shirt led to the arrest. "I don't think I've ever known of a student being suspended for a shirt," Zigmond said. On top of his arrest and trip to the police station, Marcum was suspended from school for one day. This morning, he returned to school wearing the same t-shirt, White said. White accompanied Marcum and his stepfather to a meeting at the school, where the principal, according to White, said that she "hates that it happened" to Marcum. Logan County students wore NRA t-shirts today in solidarity with Marcum, White said, adding that Marcum is an honor roll student eyeing a career in the military. Zigmond did not mention any disciplinary action during school today. White is confident that all of the evidence will work in the teenager's favor. "There's no evidence that Jared almost caused a riot," he said. "They won't be able to produce any evidence to that fact. ... The teacher should have the ability to debate things with students. I don't care how you slice it. ... It was the teacher not acting like an adult. He created the issue."